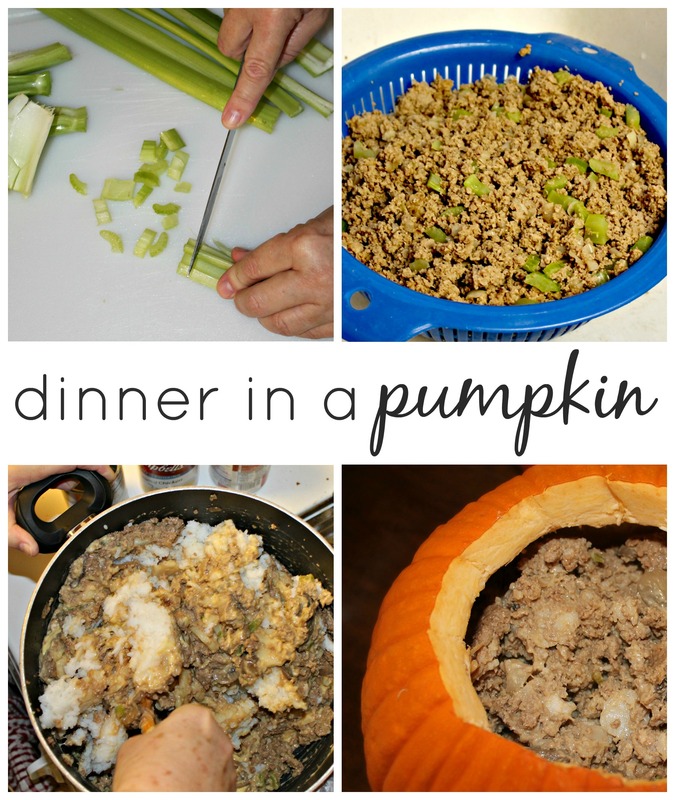 yummy and easy dinner in a pumpkin recipe! every year in october, right before halloween, my in-laws all get together and have dinner in a pumpkin. no, we don’t eat our dinner inside of a giant pumpkin (which would be awesome). it is kinda a casserole type dish that is made and put in a pumpkin and then you cook it in your oven! before i get started sharing how to make it, i just want to say thanks to my mother-in-law, robyn! 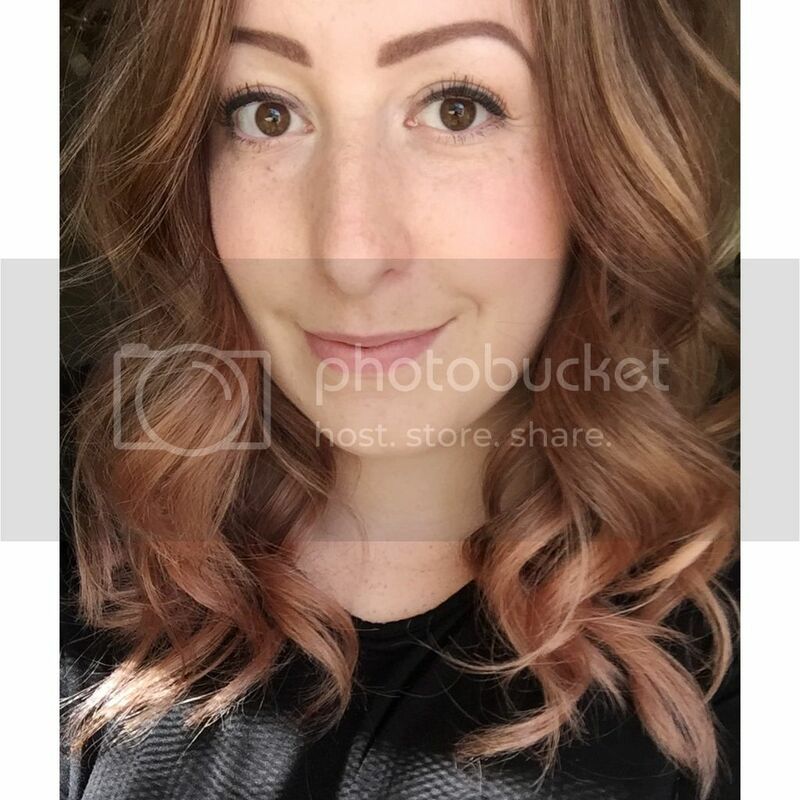 she is the lovely hand model in the photos…and this is her recipe that she has been using for about 15 years! of course a few tweaks here and there, but only to make it better! before you start anything, preheat your oven to 350 dregrees! i always forget to preheat my oven first. step one: clean the pumpkin! 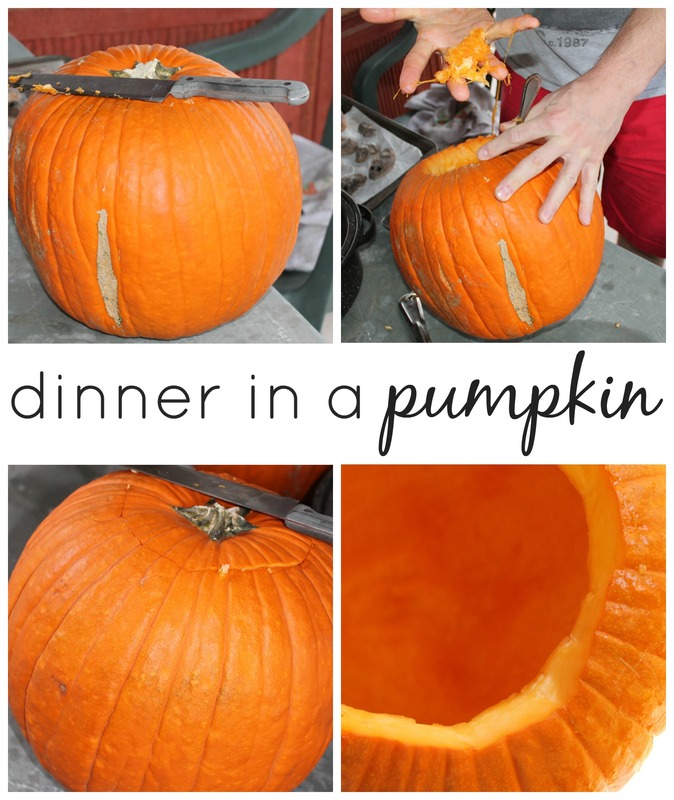 cut the top of the pumpkin off and clean the insides of the pumpkin, or make your husband do it like i did, haha just like if you were making a jack-o-lantern. after the insides are all clean, then wash the outside in the sink. DON’T FORGET TO KEEP THE TOP! you’ll need it for later. step three: add in your ground meat or ground turkey and cook until all the meat is browned. drain the excess grease from the meat. step four: add in the soy sauce, brown sugar, mushrooms, soup, rice and water chestnuts and mix all that up. (we put extra soup to make it saucier. we like things saucy.) it’s supposed to look kinda gross…but it tastes so good! step five: put the yummy concoction inside your cleaned pumpkin and put the lid back on. 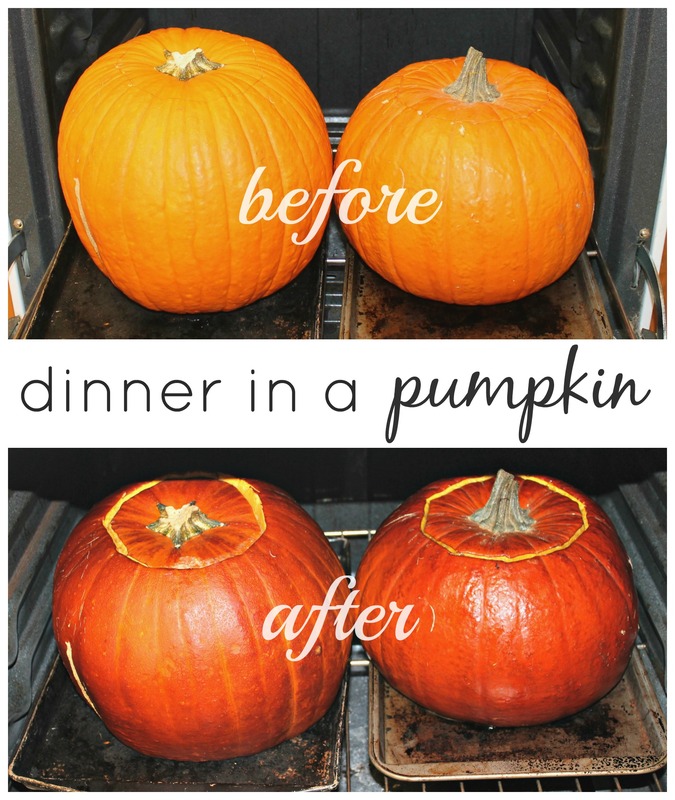 put the pumpkin on a baking sheet and stick that sucker in the oven. cook between 1.5 to 2 hours. the outside of the pumpkin will look kinda brown, like it has been sunbathing for too long and you want the meat/pulp of the pumpkin to be tender. step six: SERVE AND ENJOY! you can add hot sauce to it if you like some heat or cheese, but i don’t think you need to. it’s pretty delicious by itself. make sure to get some of the yummy pumpkin meat/pulp when you scoop it out! if you make it let me know!! it is super easy and yummy! have a happy thanksgiving guys! < Previous i have some news: 200 followers! Next > 7 tips to help winterize your nails! Ok I’ve been around the block a few times and I have never heard of this! And as weird as it sounds to me, it also makes sense and I want to try it! Thanks for a fun new recepie! You are so welcome!! It is kinda weird haha I had never heard of it before either and I thought it was weird. But it’s so delicious! Ooh, how great. I’m pinning this to make it with the littles next Halloween……how great! [My Gran used to make a more tomato-y based stew and cook it inside a hollowed out bread – I remember it was delicious!]…. We are out of pumpkins too! I contemplated waiting to post it but then I would have to wait til next year!! This is such a good idea! I have never seen anything like this and it looks soo soo soos yummy!!! It is so so yummy! You should definitely try it! It is very neat 🙂 it’s pretty simple to put together too! Yum! What a fun tradition! It is so fun! I look forward to it every year! Oh yum, that looks awesome! I did! Thanks Lena! How was yours?! thank you so much emily! that was my first time sharing!